Join us on a trip through the year 2015. 2015 was the first year for the new President, Council and FIG Commission Chairs. Join us on a trip through the year 2015. 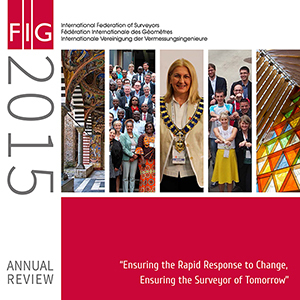 2015 was the first year for the new President, Council and FIG Commission Chairs. A hand over event was held in Athens, Greece in January 2015 to mark the hand over of leadership to the new President, Chryssy Potsiou and her Council and Commission Chairs. The Working Week 2015 in Sofia, Bulgaria was a great success with many interesting sessions and events. The Annual Review will be sent to all members together with the minutes from the General Assembly that will take place in Christchurch, New Zealand on 2 and 6 May. The Annual Review will also be inserted in the satchels to all participants of the Working Week.